Featuring condensation in advertisements for soft drinks or beer is a great way of bringing the inside out: droplets of water on a bottle, can or glass are an index of the cool, refreshing contents within. Somewhere in this visual archetype’s DNA we might also trace the contradictory associations of sweat (our own) and the unsullied freshness of morning dew on grass. Water droplets covered the walls of Aaron Curry’s exhibition ‘Two Sheets Thick’ at David Kordansky Gallery. Unlike the glinting moisture in Coca-Cola advertisements, however, these were dully printed onto large sheets of cardboard in uneven shades of grey, resembling the output of a failing photocopier. This, as with many things in ‘Two Sheets Thick’, was something of an illusion. They were in fact reproductions of photorealist drawings that the artist made by hand using a digital stylus (an oxymoronic tool if ever there was one), subsequently enlarged and screen-printed onto primed sheets of card. A fair degree of craftsmanship attended images that went out of their way to look dashed-off. This wallpaper, perhaps the most imposing component of the exhibition, wasn’t actually an art work at all, or at least it didn’t feature in the exhibition’s list of works. It did, however, wind itself like kudzu through many of the objects in the show. The Monad Has Wheels (Wooden Knight) (all works 2010), for example, was one of the slotted-together plywood sculptures for which Curry is well known, with its flat surfaces covered in the wallpaper pattern and thus camouflaged, ineffectually, against its background. By assembling flat, pictorial planes at right angles in order to render three-dimensional forms, Curry has established a sculptural practice that neatly coincides overt artistic quotation (in particular of the Modernist titans Pablo Picasso, Isamu Noguchi and Joan Miró) with formal meditation on volume and flatness. The Monad Has Wheels (Wooden Knight) adds a welcome layer of complexity via the screenprinted: the image of liquid repelled by a surface and forming separate, lens-like globules, sets in motion a chain of equivalent conceptual retractions – the object separates from its background, the image from its support, the reference from its context and the effect from its process. The apparent mobility of the sculpture’s form and meaning is underscored by the red trolley on which it sits; will it roll across the floor and melt into its background, or will it scoot straight out the door into the street outside? In other works, such as Power of Off, the wallpaper flooded the negative spaces of objects. A couple of two-metre-high sheets of tangerine, powder-coated aluminium leant nonchalantly against the wall, which was visible through holes cut unevenly in each. The effect was startling: the two holes became eyes, and so the flat planes took on an almost animal presence while simultaneously revealing their shallowness. This paradox, and its wide-ranging implications, might be said to be at the heart of Curry’s practice, which has taken root in a city in which no one underestimates the depth and weight of an image. Elsewhere, trompe l’oeil – the quintessential example of a picture masquerading as an object – was deployed by the artist in order to reshuffle assignations of value. In framed assemblages such as Blue Blockers and Pink Fink, fluorescent card floats over the screenprinted wallpaper pattern (itself a form of degraded trompe l’oeil) and layers juicy, airbrushed teardrop forms with scatological finger painting. These latter parodies of authentic artistic expression (applied in gouache, favoured by graphic designers for its deadpan effect) are adorned with delicately rendered, hyper-realistic beads of water, also in gouache. If wetness in this exhibition was a cipher for desire, freshness and immediacy, Curry’s absurdist efforts to synthesize its appearance using the driest available media seem not just aspirational but melancholy, even desperate. 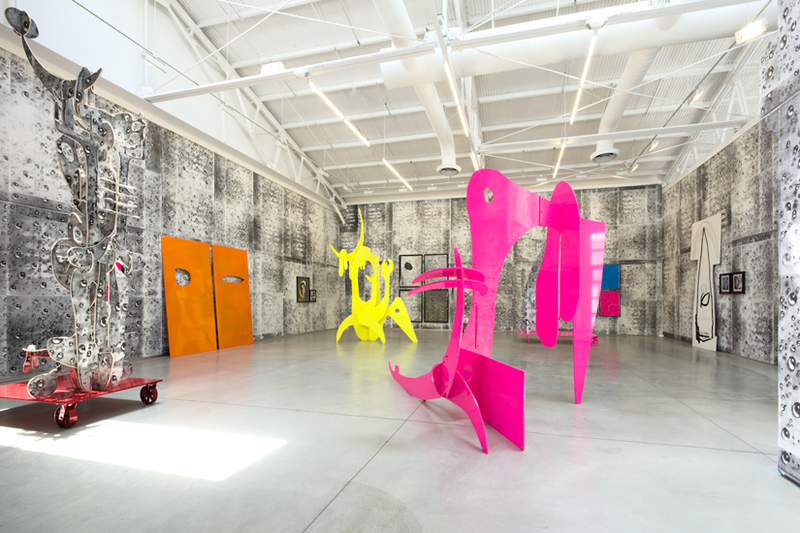 An answer to the arid greys of the installation came in the form of the fluorescent colours that recurred throughout Curry’s sculptures and collages. Like retroactively applied water droplets, fluorescents speak of an unconvincing stab at newness: in the 1980s they stood for a zingy, chemical modernity; now even their resurrection in ironic, nu-rave fashion seems somewhat passé. At times, this pervasive colour scheme, along with the motifs that hop from sculpture to picture to wall and back again, gave the sense that Curry is hammering his points home. He is certainly unafraid of repeating himself; alongside The Monad Has Wheels (Wooden Knight) stood comparable works titled The Monad Has Wheels (Elephant Boy) and The Monad Has Wheels (Pink King). This over-production – and the quickness with which many of the works appear to have been hashed together – is a conscious affectation, and belies the thoughtfulness of the artist’s process. When he signs his work in thick, childish capitals, we understand that A. CURRY is in fact not himself; he is channelling spirits from distant times who have come to tell us about the desert that we currently inhabit.